The World Health Organization removed Toronto from its list of SARS-infected areas Wednesday, saying Canada's largest city had contained the virus. The decision means Taiwan is the last on what was once a long list of countries reporting local transmissions in the last 20 days. It will likely shed that distinction Saturday if there are no new cases between now and then. "This is a great achievement for public health in what we hope is the final phase of the global emergency," said David Heymann, WHO's head of communicable diseases. "Toronto faced an especially challenging outbreak." Toronto had the largest SARS outbreak outside of Asia, with 39 deaths and almost 250 cases. More than 27,000 people in and around the city were forced into quarantine during the two outbreaks — one in March and April and the second in May and June. Although there have been no recent new cases, a number of people remain critically ill and the death toll could rise. The latest death Sunday was of a nurse — the first Canadian health care worker to die from SARS, or severe acute respiratory syndrome. 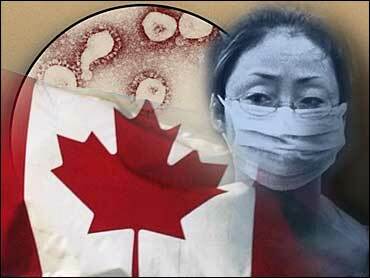 Canada was one of the first places affected by SARS, which is believed to have started in southern China and spread to other places through air travel. The WHO in April warned travelers against all but essential travel to Toronto. It lifted the warning a week later, but the initial cancelations and a second outbreak of the virus in May have devastated the city's tourism industry and had a large impact on the economy. The WHO's announcement is a timely boost for officials from the Canadian city of Vancouver who are bidding for the right to host the 2010 Winter Olympic Games. The decision from the International Olympic Committee, meeting in Prague, is expected later Wednesday. Elsewhere, the SARS outbreak in China cost millions of rural migrants their jobs in cities, but forecasters say the economy should still grow by up to 8 percent this year, the official Xinhua News Agency said Wednesday. Construction and other migrants were hurt as tourists heeded advisories to avoid SARS-affected areas, setting off a slowdown that spread throughout China's economy. The disease killed 348 people on the country's mainland and infected more than 5,300. Some 8 percent of China's 90 million rural migrants were "deprived ... of their jobs in urban areas," Xinhua said, citing a report by the Chinese Academy of Social Sciences, a government think tank. Xinhua didn't give an exact figure, but that percentage would be equal to about 7.2 million people. The epidemic has had a "serious" negative impact on rural income, Xinhua said. Such losses would be especially alarming to Chinese leaders, who already are afraid of unrest among farmers who protest frequently over poverty and high taxes. Despite the outbreak, a separate CASS report said China's economy should grow by 8 percent this year, Xinhua said. That was down from an earlier projection of 8.6 percent but still higher than the 7 percent target cited by Premier Wen Jiabao on Sunday during a visit to Hong Kong. Job losses apparently occurred despite official orders to employers not to fire migrants for fear they might leave cities and spread the virus that causes severe acute respiratory syndrome. "The effect will spread to the manufacturing industry if weak demand from the service industry and the fall in increases in urban residents' income are not curbed," Xinhua added. The heaviest economic impact was in Beijing, which suffered 192 deaths from SARS and whose tourism industry was devastated. Thousands of its estimated 3 million migrants left in April after the Chinese capital closed schools, cinemas and other public facilities and fears spread that the entire city might be quarantined. While some migrants have returned to cities, many lost jobs at restaurants and other businesses that closed because of the outbreak are gone for good, said Mo Rong, a researcher with the Ministry of Labor and Social Security. College graduates lost out because anti-disease measures kept employers from visiting campuses for recruiting, Mo said at a news conference. "The immediate impact is over, but there will be a longer-term effect on job creation and employment," he said. The loss of jobs is especially daunting at a time when China is trying to generate new employment for people laid off during an overhaul of state industry. China needs 24 million new urban jobs this year for laid-off workers and others, but expects to have only 10 million, Xinhua said, citing official statistics. The CASS report recommended that the government try to encourage job creation by cutting taxed and fees and offering financial aid to some industries, Xinhua said.